A patient queue of college-aged friends, the occasional huddle of teens, and middle-aged couples silently stand outside Usher Hall, clad in jeans, sneakers, and a wider array of casual, quotidian attire. If you weren’t attending the event, you might not even realise that this was a queue of concert goers. 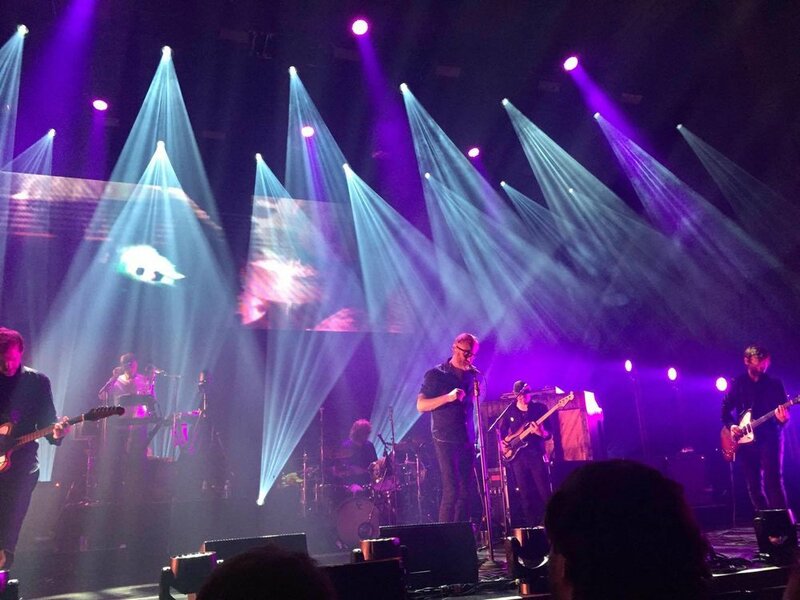 This was indicative of The National who, in their off-brand nonchalance mustered just the necessary amount of energy to perform last Wednesday evening in Edinburgh. Before reuniting with Matt’s characteristically deep vocals and The National’s typical quiet, calm presence, attendees were softly awakened by the lullings of Luluc, an Australian indie-folk duo who, coincidentally, met one another in the city many years previously. With songs such as "Without a Face", "Star", and "Tangled Heart", the couple successfully relaxed what felt like an already mellow crowd, warming up our ears for what was to come. Their set was modest, but the performance just as beautiful as it was simple; Zoe Randell stared wide-eyed and blankly out at the crowd, while Steve Hassett shook his long locks to and fro with each strum of his guitar as they seamlessly harmonized. Between songs, the duo thanked and conversed with their audience, and it was obvious that Edinburgh held a special place in their hearts. After a few songs and later some collaborations with The National’s guitarist, Aaron Dessner, the Luluc duo and Aaron hugged and thanked one another, smiling and parting as old friends would following a satisfying jam session. It was indeed a heart-warming vision, further accentuating the concert’s overall casual and friendly vibe. The lights brightened once more, and upbeat instrumentals were introduced as a timer and looping powerpoint featuring the The National’s 7th album Sleep Well Beast’s cover and logo lit up on the back wall. After about a fifteen-minute interim, the timer transitioned to a live feed of the backstage area as the tech crew continued work setting up the stage. Taping down a flurry of spikes onstage and moving speakers and equipment, the setup proved to be quite a meticulous process. I overheard neighboring attendees comment on the detailed arrangement, noting the precision and care each technician seemed to have in lining up mic stands with specific placements onstage. Several times, we were greeted by a blank faced technician reciting inaudible phrases into the mics whilst another hollow-eyed employee halfheartedly tested the drums, never looking at the audience with each pump of the beater. Simultaneously throughout this entire process, The National continued with what they were doing on camera: snapping photos, drinking coffee, and chatting away, seemingly waiting with their own audience as the venue’s crew prepared the stage for the performance of their music including latest album, Sleep Well Beast. As the timer neared half an hour, a trio of geometric shapes flashed on the wall, with the request for us to ‘Please Stand By….’. Suddenly, the camera moved, following the band members as they left the green room and ventured backstage, finally funnelling out from the curtains and taking their place in front of us. The National’s performance and overall visual entertainment executed that evening was in accordance with the tone and atmosphere of their new album, all the while reminiscent of their older, nonchalant, ragged rock. Hues of purple, blue and yellow-white boldly cut across the stage and audience in sharp beams of light, while slowly, quietly, and almost unsurely, Matt and the rest of the band begin their performance of the album’s first song, "Nobody Else Will Be There". Knees bent, slightly hunched forward, and fervently clinging to his plastic cup of what was perhaps beer, Matt subtly side steps toward the instrumentals and percussions, which roll slowly into the room. Everyone, performers and viewers alike, stand with grave expressions, lost in their own wandering contemplations, until Matt’s hoarse voice meets those thoughts. Immersing yourself in the piano, percussions and Matt’s voice as they blend into one, there are suddenly no more anxious questions floating in your head. The first song comes to an end, Matt continuing his steady stream of sips, head bowed and focused on the mic in front of him. Bouncing slightly, he then begins speaking the opening of Walk It Back. His grovelling tone doesn’t put you to sleep, but rather excites and entices his audience to anticipate something bigger to come. Indeed, after this the pace quickens with Guilty Party, the ambiance further augmenting as they next play their famous 2013 track, "Don’t Swallow the Cap". Matt paces, his back to the audience, and none of the other band members seem to be jiving to their tunes. Nevertheless, we are screaming and bopping our heads even while Bryce silently switches guitars and Matt walks away from his mic. The National are pensive, stoic and unsmiling, while just across from them, their fans smile, whoop, holler and stamp their feet. There is a dissimilarity between the attitudes of the performers and viewers, but the band have their audience wrapped around their little finger thanks to a clean, strong performance of live music. Indeed, while their stage presence might at first seem dull or lackluster, it is this exact detail coupled with their borderline eccentric yet harmonious accumulation of sounds that prompts their audience to move and cheer for more. Performance-wise, the band look a whole lot like a bunch of angsty teenage boys that simply grew up. Matt seems to fit the role of ‘cool dad’: pacing, fist pumping, sipping a beer and rallying everyone on and offstage with his awkward arm and hand movements. After a handful of songs performed without stopping midway through the concert he finally taps into his energy reserves, tossing his drink into the air, and splattering a concoction of lukewarm beer and red bull onto his gaping fans. Accompanying brothers Aaron and Bryce pluck and strum perpetually, brows furrowed in concentration and dedication. In his yellow ball cap and black square shades, Bryan coolly assesses the crowd, smacking the drums with confident precision, while Scott and additional percussionists upstage keep the rhythm flowing. Transitioning into some of their older music, the energy and volume picked up as both the audience and band grew more comfortable, dealing with more familiar grounds. The lights and overall visuals done by the tech crew also seemed to transition and become more intimate. The lights during the performances of tracks on Sleep Well Beast were generally bright and shiny, more characteristic of a generic, standard, rock concert. With their older and often more famous tracks, the visuals warmed and encircled the audience, bringing them and the band together. During their performance of “Bloodbuzz Ohio” for instance, lines of bright red light were projected continuously down the walls, running parallel to one another while from above, white streams of light peered down on the stage and audience. Together, these gave the feel of being in a dark barn, light streaming in through the cracks along the walls and sunlight pouring through wooden beams above. Using less lighting effects during their performance of “Green Gloves” and others shrank the room, bringing each body and voice in the room closer together. Afterwards they transitioned back into songs from their new album, playing “Carin at the Liquor Store”, “Day I Die” and more, and ended with a return to their older tracks such as “Terrible Love”, “Mr. November”, and “Fake Empire”. Because we had to catch a train back to St Andrews, my friend and I left before seeing the final few songs and ended our night with “Fake Empire”. Nevertheless, The National did not fail to make their mark. From various points in the crowd, such as standing directly in the line of spotlights amidst bubbly teens and twenty-something year olds at the front, to the quiet and darker back among older and married couples, the same blasé but defined quality of music carried all throughout the night. Sleep Well Beast has been met with an overall range of very positive reviews from The Guardian, Pitchfork, NME, and more, but while its tone and aura include their familiar riffs and musical blends from before, the album presents a different, more uncontrolled side of The National. Outbursts present in “Turtleneck” and “Day I Die” are tempered by subdued sounds created in “Dark Side of the Gym” and “Empire Line”. It is different from their last album Trouble Will Find Me, but as their performance this evening and their new album’s overall salute to the ‘matter of existing’ remind us, The National are still that sobering band we love, as relevant and aware as ever.